Chef "Fuji" of The Hump Restaurant. “Chef, is it true that if a customer dies from your fugu, then you must commit seppuku?” I asked. “That’s an insult!” an apprentice demanded. "Those are just stories,” the chef sighed. My paranoia was uncontrollable. I was getting closer to my deadly date with poison blowfish and was becoming more nervous. My fear was conspicuous and showing like severe rosacea. Also I was fatigued. I slept terribly the night before because of nightmares. Oddly, my nightmares weren’t about fugu, they were about Todai, an all-you-can-eat sushi restaurant. In one nightmare I was being force-fed the rice stuffed, fried tofu skin sushi called inari. All that inari made my stomach expand quickly and with great force until eventually it burst, killing me. I couldn’t stop obsessing about death. Before I left the house for The Hump Restaurant, I wrote down some emergency numbers on a piece of paper and put it in my wallet just in case. When I entered the restaurant, the staff greeted me with the traditional “Irashaimase! !” But, because of my paranoia, instead of “welcome” in Japanese, I heard “You are going to die from fugu, you foodie freakshow! !” In reality, everyone at The Hump was exceptionally pleasant, from the manager to the wait staff, suspiciously pleasant, upon further reflection. It was the type of courtesy a condemned prisoner receives from his guards when he’s doing the “dead man walk” to the gallows. I couldn’t shake this macabre feeling. I really needed to be served my plate of fugu sashimi and just get it over with. But you can’t rush fugu sashimi also known as fugu sashi. It takes time and tender loving care to plate an order of it. I noticed that the chef removed the fugu from a clear, plastic container. I also noticed that the fugu was not whole but in unrecognizable segments. 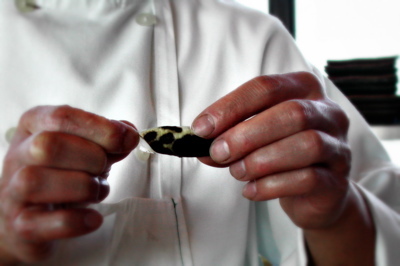 Chef “Fuji”, a serene, agreeable man, had been the person, nay, the surgeon, preparing my fugu sashi. He also had the ultimate patience with my anxiety-driven questions. “Chef, why is the fugu in a plastic box?” I pondered aloud. “It is shipped from Japan. The poison has been removed and shipped here,” Chef Fuji answered. The blowfish I was being served was in fact from Japan. The most toxic bits like the liver and ovaries were removed by a licensed fugu chef before being packaged and sent to the U.S. Then Chef Fuji held up a piece of the fugu’s skin for me to see. “This is torafugu. See the markings?” Just like that, the wind was knocked out of me. Torafugu. I’ve heard about this cherubic little beast. Torafugu or Tiger blowfish is the deadliest of these death fish. If torafugu was a nemesis in a videogame, it would be found in the final level where all hell breaks loose. The pattern on its skin, vaguely resembling a tiger’s hide, betrays the fact that the torafugu contains more neurotoxin than the average and more commonly used takifugu. For perspective, takifugu, the common blowfish, contains enough tetrodotoxin to kill up to 30 adult humans. “In the case of torafugu, the ovary alone sometimes weighs over a kilogram and contains enough poison to kill some 20 people,” explains Takeo Koizumi, Professor, Tokyo University of Agriculture. This was enough to make my head spin and I hadn’t even taken a bite. "Is this part of the fugu experience?" I wondered. Then like a fugu samurai Chef Fuji unfurled his knife roll and unsheathed his fugu hiki — the only knife a fugu chef is permitted to use when cutting fugu. (This is definitely a time you don’t want any cross contamination happening between my ballsy fugu and your pansy California roll.) 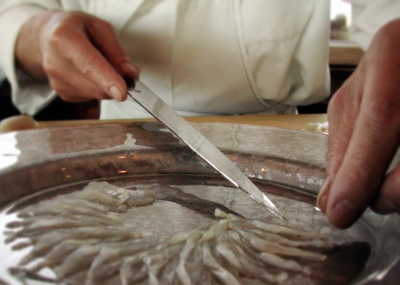 The fugu hiki was so polished it blinded, so sharp and deft it was reminiscent of “Sting” the Elvish blade feared by the Orcs in The Hobbit, and so effective that in Chef Fuji’s hands it made tissue paper of torafugu flesh. The chef artistically laid down each petal of transparent and pearlescent meat onto a deluxe platter that mimicked the fugu’s flesh color. 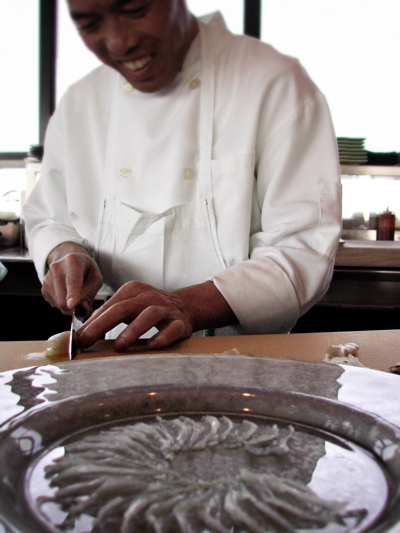 Chef Fuji's plating broke from tradition where usually a platter with fanciful scenery is used. Although obscured in a foggy haze, the picture is still visible due to the transparency of the ultra-thin fugu slices. Nobody but a marketing wizard could’ve come up with all that. The cynical point of view is that fugu is sliced impossibly fine because fugu is impossibly expensive. Also fugu is a twerp. The chef has to make a little go a long way. After carving up the flesh, the rest of it is sliced up though not as delicately. My fugu was nearly ready. I could almost taste the life leaving my body. The manager asked if I would like a fugu sake to accompany my fugu sashi. I asked him the price. He said the cost was forty-five dollars a glass. What the hell. You only live once, I figured. The lovely waitress brought the plate of fugu to the table. The presentation was heavenly. It was perhaps the prettiest plate of food I’ve ever seen. 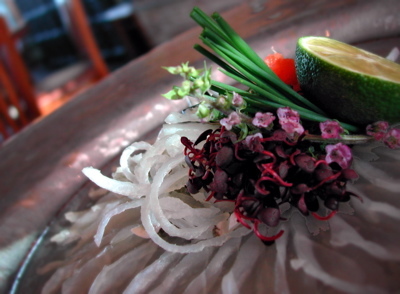 The fish flesh was arranged in a flower pattern made to look like a chrysanthemum. The chrysanthemum in Japanese culture symbolizes death. In the center of the chrysanthemum design was the comely garnish. The benitade sprouts offered deep purple hues to the bouquet and a peppery taste to the ponzu sauce. The light violet gentleness of the hanaho flower sweetened things up. The finely sliced negi or green onion was flanked by its cousin the fresh and firm chive sticks. A dollop of the bright salmon-toned momiji oroshi, a grated daikon mixed with cayenne and paprika, livened the bunch. Also the limelike sudachi provided a nice zing. Once again, the “flower of death” or kogiku made an appearance only this time as a garnish — this miniature chrysanthemum was yellow and bitter. Combined, it all looked like it could be a Martha Stewart inspired centerpiece at a wedding reception. But on second glance, the vivid garnish on top of the cold, gray meat and platter more resembled an arrangement of flowers on a grave. Gulp. The beauty of the dish, however, lulled me into a warm glow of security. It cooed to me that all things beautiful are good. I was lulled and I believed. I selected a feathery piece of fugu and peeled it from the platter. It continued to seduce me with promises of euphoria and heightened pleasure. I dipped it into the ponzu sauce. I then grabbed a sampling of all the garnish and huddled them with the fugu. I lifted this packet of poison to my lips, closed my eyes and ate. I swirled the fugu, the flowers, the sprouts and the others in my mouth trying to identify the flavor of death. I strained to detect any numbness or tingling, any new sensation or buzz like a teenager popping his pot smoking cherry. Finally I swallowed everything. I sat for a while thinking about what I just had done and whether I had survived and how long I have left to live and all kinds of crazy, scattered thoughts. Then I had one clear thought. Maybe this was it. This could be the key. It needn't be complicated or dramatic. No light at the end of the tunnel. No clarion blasts. Not even any tingling or numbness. It very well could be quite simple. Death, I thought to myself, tastes a lot like ponzu sauce. Why would Eddie do such a crazy thing? Read Part 1 of Eat Fugu or Die Tryin’ to find out. >It needn't be complicated or dramatic. (laughing) no, but even the slightest idea of the even slighter possibility of death by fugu is, otherwise this wouldn't have been a two-part post! you know, i eat prepared fugu from the local japanese equivalent of a 7-11, and it's fine. more importantly, i'm fine. it also comes freeze dried in an insta-noodle soup--i think you'd be more likely to get msg poisoning than anything else. Phew...you're alive! Excellent post as always. Looking forward to hearing you regale KCRW listeners with this tale! Actually, your Todai nightmare scared me more than the fugu. I mean, sushi is one of my favorite foods, but that place is like the Wal-Mart of sushi. Tastes like it, too. 2/ How much did the fugu dish cost in the end? 3/ They don't have original japanese chefs at The Hump????? 4/ Did Ben eat it too? Is he ok? 5/ chrisantemum symbolizes death in many European countries too! Do you still live outside of the U.S.? Because I'm wondering where you can find that fugu with the instant noodle soup. Sounds perfect for me! I made it through the dark tunnel. I'm alive!! Did you know, Elmo, everytime a bell rings an angel gets his wings? Merry Christmas, Bedford Falls!!!! Imagine Wal-Mart selling sushi. Omigod, Becky! I have to be honest and say that occasionally I love the all-u-can-eat slop at these kinds of places. It's my secret indulgence. You sure do ask lots of questions. But I'll answer them because I kinda like you, kinda. 1) Ponzu sauce is a salty-sweet soy sauce looking sauce invented by a chemist named Ferdinand "Skippy" Ponzu. He died from fugu poisoning and was struck by lightning. 2) The fugu cost nothing because I am a famous food writer and other people pick up the check. 3) I don't understand this question. "Original Japanese chefs at The Hump?" The looked Japanese to me. If you're asking me if they are the first Japanese chefs in the history of the world, then, no, they are not. They are probably many generations away from those chefs. 4) Yes, Ben Adair of KPCC's "Pacific Drift" radio show did eat the fugu with me. Is he okay? Well, he wasn't okay before the fugu and he's not much different after. But thanks for your concern. Do you have a crush on him? He has a girlfriend. Maybe more than one even. 5) "chrisantemum symbolizes death in many European countries too!" This is a statement not a question. And please use spell check next time. It's embarrassing. Thanks for visiting and please tell your friends about us! Brilliant, BRILLIANT review. Thanks for enrichening my coffee break. "This is definitely a time you don’t want any cross contamination happening between my ballsy fugu and your pansy California roll." That made me laugh out loud. Good thing I didn't blow coffee all over the screen. Question though: How is "fugu sake" different from ordinary sake (secret ingredient: expensive neurotoxin antidote...)? And what did it taste like (probably sake, but still...)? i'm glad you didn't spew all over your monitor also. i've never cried over spilt milk, but, boy, have i cried like a baby over spilt coffee, especially if the coffee was spilled on the computer. thanks for asking about the sake fugu. i am deliberately saving that bit for my special article on "deep end dining drinks" or "deep end drinking" if you will. come back and check on me. thanks. you are insane. good post keep it up. you need better and larger pictures. Mr Lin: Good to know, looking forward to it already. Oh, and the pictures are fine IMHO. Eddie, that was very nicely written. Felt like i was sitting next to you assisting you in drawing up your will. How did the fish taste? and how much was that lethal meal? I have nightmares about Todai, too. I love that Sasbune took over their Wilshire location. I really enjoyed these photographs. I didn't know that The Hump served fugu. Did you special order it, or can anyone try it? thanks for being by my side. it means a lot. you were the wind beneath my fugu fins. the plate of fugu sashimi was a whopping $60. you can also get tempura fugu for cheaper $20. the fugu sashi plain without any sauce tasted like nothing. but if you're lucky you detect the faintest of sea breezes and salted air. todai nightmares and falling nightmares and naked in public nightmares, they're all scary. sorry you had one. anyone can order fugu at the hump. HOWEVER, it is NOT on the menu. you need to ask your server and you should also call in advance just to be sure they have it. usually there is no need to special order or call ahead when the fugu is in season fugu season is around winter. probably beginning in october and going til march. this is when the waters are extra cold and it's also before mating season. the rules are kinda the same for oysters. Did you watch the episode of "A Cook's Tour" where Anthony eats fugu? In the end he seemed disappointing that he didn't...die...or semi-die. Cool episode though. I'd only eat fugu if someone else footed the bill. (cough) YOU'VE GIVEN ME A GOAL TO STRIVE FOR! i've seen that episode of "a cook's tour" and so i wasn't too surprised when i had the same experience. however, i am surprised that he didn't encounter ANY kind of sensation because he did have his in japan and not in the U.S. like me. someone paid for my fugu and now i am his geisha for life. there is no such thing as a free lunch, or, in my case, free fugu. teehee (covering mouth daintily). I've got on pimples related info. Sushi at Walmart? They have sushi at 7-11 in Asia. Also sitting outside in 85 degree weather. The first few times I ate fugu, I only knew the Chinese name, not the translation. No one told me what it was until after I had eaten it. I just ate what??? That's what [insert Chinese name] means?? ?